Bhagat Singh was a true patriot; a nationalist par excellence. He was not today's version of the extremist who kills innocent people in the name of God or a political cause. The care he took in making sure no lives were lost, when he exploded a bomb in the British parliament, bears testimony to this. The Congress has long ruled India, after her independence, and they have made sure that nobody apart from Mr. Gandhi and Mr. Nehru have got the recognition due to them. Apart from the usual number of unsung heroes, even the ones who were adored by the masses have been slowly and deliberately deleted from the public memory. The Congress politicians, who by the virtue of the official powers they wielded through various organizations, made sure of that. Bhagat Singh's disillusion with Mr. Gandhi's methods is well known. He had good reasons to be disappointed with the Mahatma. I personally believe that Mr. Gandhi, in his zeal to spiritualize the freedom movement, made many tactical mistakes. His biggest blunder was when he called off the Non-Cooperation Movement. We can never know for sure, but in all probability it would have gotten us independence sooner and even prevented the partition. Bhagat Singh rose in stature from one event to the other. He started out as a hot-blooded youth, but evolved into a thinking 'kranthikari'. He was attracted towards the socialist model like most of the people during his time. He dreamed of an India that is not only independent but also fair, just and egalitarian. He probably would have changed his mind had he seen the mess that socialism got India into, but then again, we would never know. He died when he was just 23 and long before India became a free nation. If Mr. Gandhi was the all-too-well-accepted side of the freedom movement, Bhagat Singh was the other side of it. He was no less patriotic than the Mahatma, but languished from the lack of recognition for his cause. He hated being branded as a hotheaded youth at best and a terrorist at worst. This image he got initially, was thrust upon him more by the Congress, than the British themselves. With the notable exception of Mr. Bose, a majority of Congress Wallahs, being the usual cronies they were, and still are, took the cue from the Mahatma, and tried to make him appear as irrelevant as possible. At first, they succeeded too. Then came the imprisonment. Bhagat Singh showed the entire nation he was not just all anger, exuberance and impetuousness. With his strong silent moral courage, he convinced everybody, that when the occasion came, he would rise for it; and rise he did. His hunger strike in the prison to get better conditions for the prisoners is one of the most memorable events in the history of Indian freedom struggle. 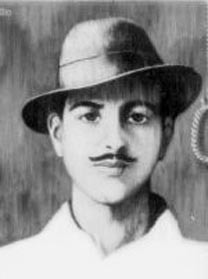 I believe, even the most ardent Congress Wallah bowed to him inside his heart of hearts, when Bhagat Singh went through his Satyagraha. After all, he was practicing what they were preaching all along. Then again, a Congress Wallah is a loyal crony and this trait is epitomized in the croniest of them all, Mr. Jawaharlal Nehru - the biggest blunder ever to happen to India. We are still suffering from his 'nation building'. But that's the theme for a whole new essay - may be even a tome. While Congress grew stubborn and more stubborn as the day when Bhagat Singh would be hanged approached, the rest of the nation began to love him more and more. The Satyagraha made him a household name, a hero who cared for his motherland unabashedly without seeking his own fame. Even the current generation recognizes Bhagat Singh. They might not actually know what all he did, but they do know he was somebody who mattered. This is despite all the efforts made by the Congress, after India's independence, to ignore him. That's why it was so benumbing to the nation, when Bhagat Singh died. Most possibly, he could have been saved with an effort by the Congress in general, and the Mahatma in particular. But that was not supposed to be. Bhagat Singh is our nation's pride. It would do good to the current MTV generation to know of a man, who lived by his ideals till he breathed his last. There can be one and only one Bhagat Singh. Indeed.